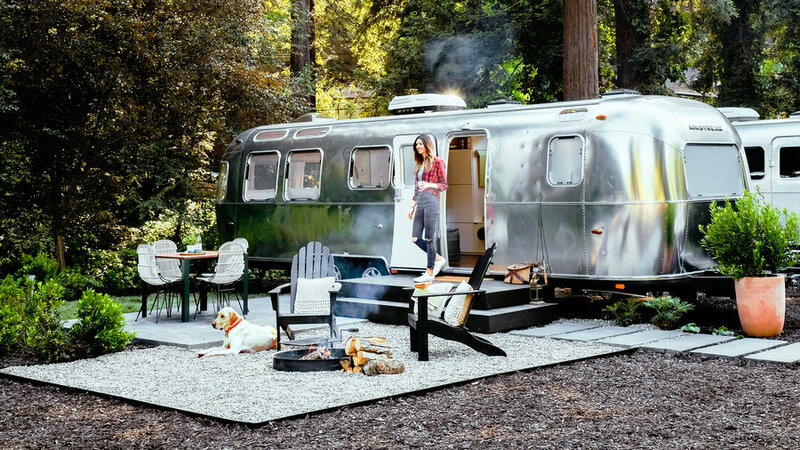 Guests staying at Guerneville’s AutoCamp Russian River are bound to make friends at the Richard Neutra–inspired clubhouse pavilion (stocked with craft beers and local wines) before retreating into one of the camp’s 24 Airstreams on Sonoma’s Russian River. These aren’t your ordinary silver midcentury moderns but custom models styled by Dan ­Weber Architecture and ­Geremia Design. Walnut cabinetry, a full shower, and Casper mattresses make this an alfresco overnight that’s more like a true ­hotel experience. From $175. 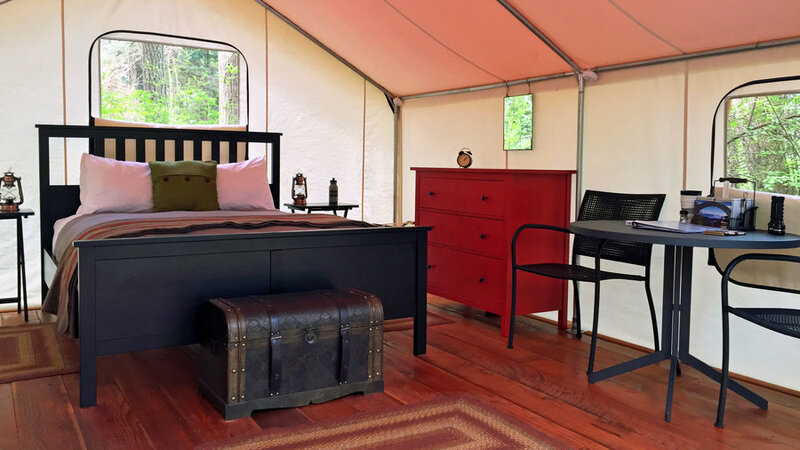 Located in a temperate rain forest on western Vancouver Island (remote enough to require a seaplane or ferry to reach it), Clayoquot Wilderness Resort has been fluffing mattresses and dusting tea tables in its 25 raised-platform prospector tents since opening in 2001. 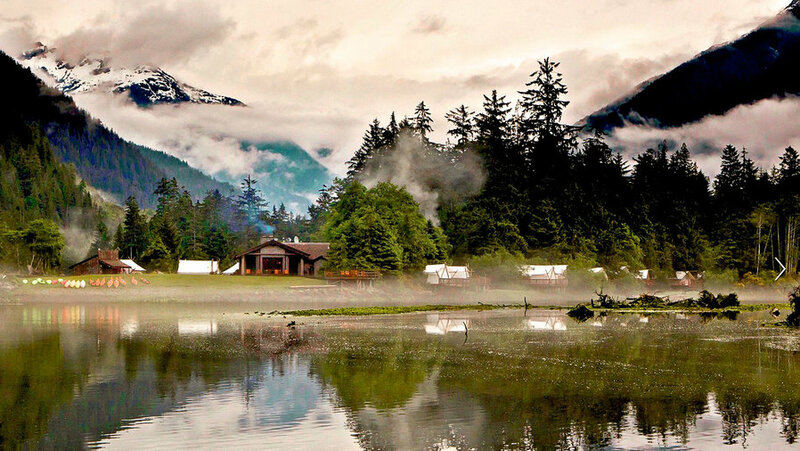 In 2015, the resort redefined wild luxury with the launch of Cloud Camp; you’ll need to be helicoptered to the swank tents 4,500 feet above sea level on Ursus Mountain. $1,943 U.S./person, including helicopter ride. 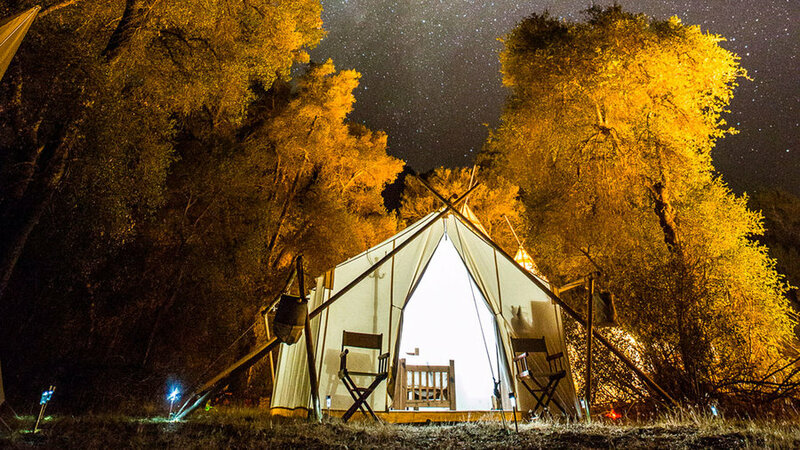 The fast-expanding Under Canvas, which inserts cushy tents in national parks, has opened an outfit on 56 acres of a ponderosa forest 40 minutes from the Grand Canyon’s South Rim. Choose from an African safari–inspired tent or a rawhide rug–adorned suite with a private hot shower. From $189. 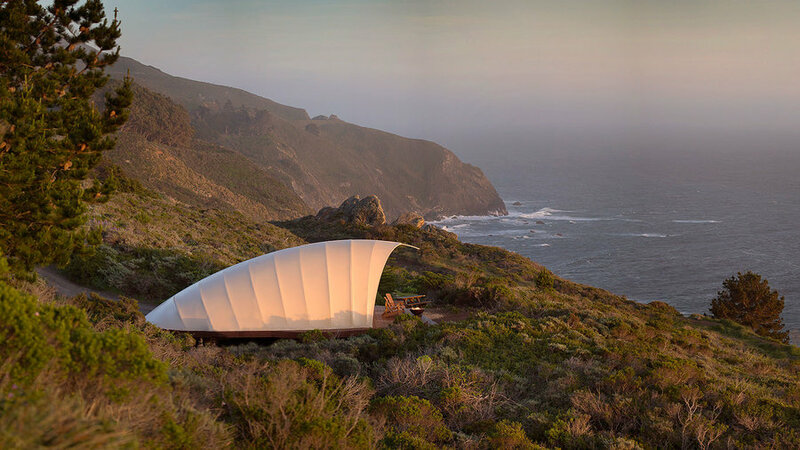 Commanding unobstructed panoramas of the Pacific Ocean from its Big Sur hilltop perch of 10 acres, Treebones Resort’s latest is the Autonomous Tent, which resembles a miniature Sydney Opera House and packs a king-size bed, a gas fireplace, and a claw-foot shower into its distinctive structure. You can also choose to sleep in a yurt or even a human-size bird’s nest woven out of wood. From $263. 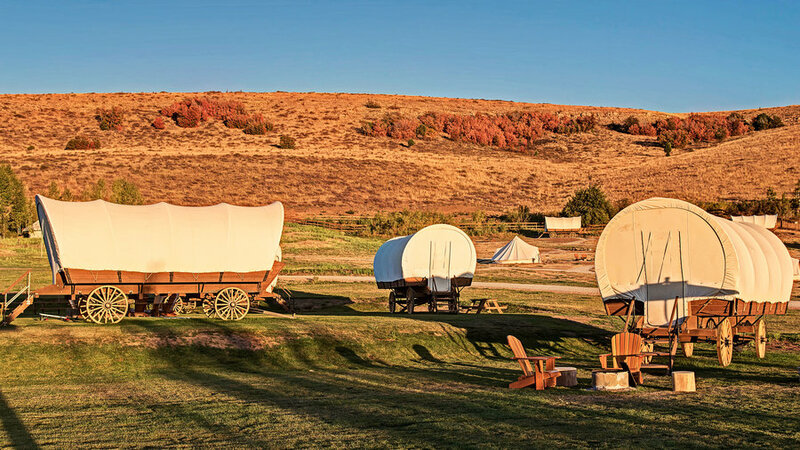 If you’re aiming to get into a bit of a pioneer spirit but without the hassles of having to sleep in the dirt or tie up a horse, book a wagon at Conestoga Ranch. The resort also rents traditional safari-style tents, all of which are near the turquoise shores of Bear Lake in northern Utah, which has earned the moniker “Caribbean of the Rockies.” From $75. Ocean Village Resort, Vancouver Island, B.C. Where the twisty Pacific Rim Highway on Vancouver Island ends are clear lakes, intricate inlets, and an old-growth rain forest—no wonder some migrating Pacific gray whales decide to stick around all summer. 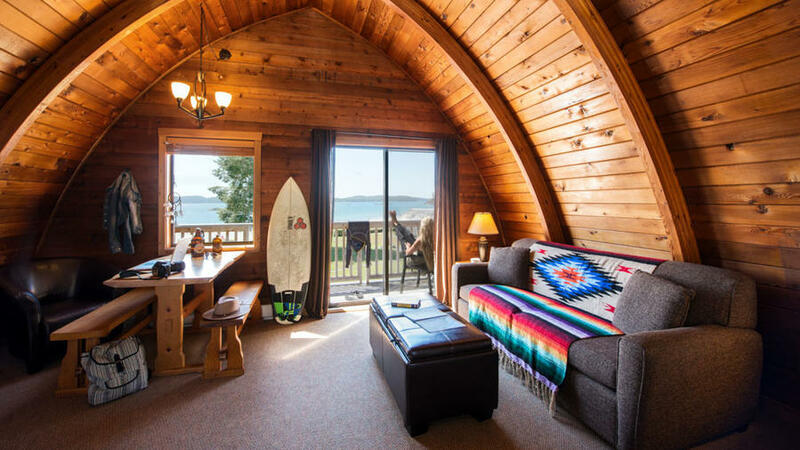 Those who can’t get enough of the scenic peninsula’s ocean views should camp in one of Ocean Village Resort’s arch-shaped beachfront cabins with soaking tubs, full kitchens, and private patios. From $229. 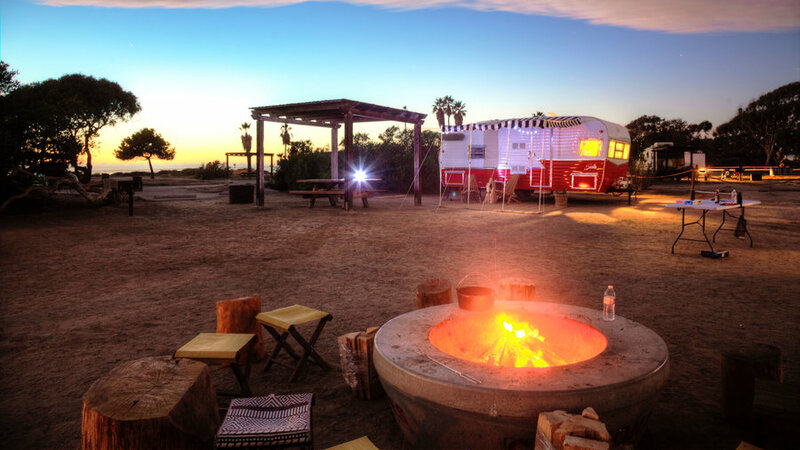 For fans of nostalgia (or Mad Men), The Holidays has four 1960s-inspired trailers parked inside San Clemente State Beach, whose mile­long sand is bookended by an imposing bluff and Pacific surf 58 miles from San Diego. Each trailer retains its vintage shell but comes updated with USB hookups and bluetooth speakers. Neighbors can challenge one another in a game of bocce or a cook-off on the grills. $209. Once a popular pit stop for itinerants on stagecoaches, the storied RimRock Inn may be way off the grid, but it doesn’t skimp on amenities like full country breakfasts and of-the-moment wool blankets and textiles by Oregon’s own Pendleton Mills. Spot the shooting stars through the four tipis’ open skylights, and emerge to the misty morning vista of Joseph Creek Canyon. From $115. Orcas Island, in the San Juans, harbors stunning Moran State Park (the fourth largest in the nation), which has roughly 33 miles of hiking trails that meander among several lakes, lodgepole pines, and tucked-away waterfalls. Take in the scenery from a duvet-topped bed thanks to LEANTO, which sets up five glamps seasonally, even delivering coffee (for an extra $9). From $150. 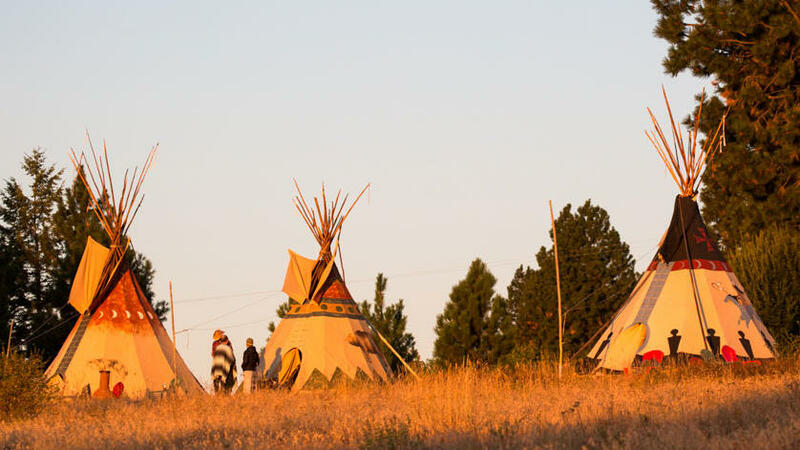 Connect to the heritage of America in the prairies of northeastern Montana, the very land that Lewis and Clark and homesteaders once traveled. 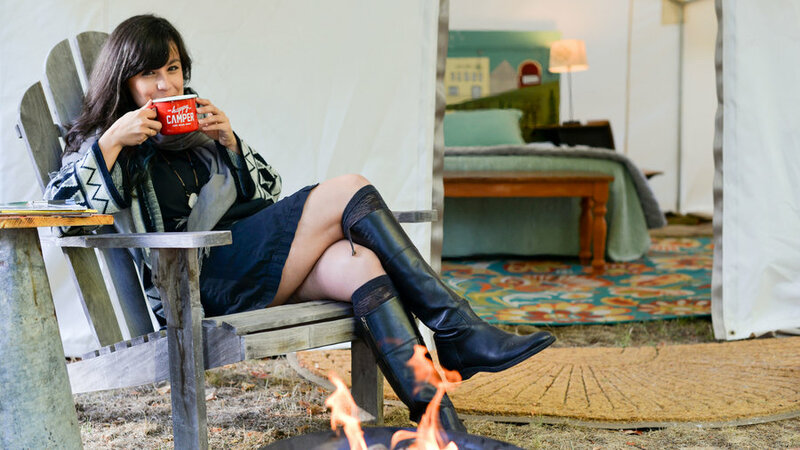 At Kestrel Camp, however, you’ll have it much better than the early pioneers, slumbering in one of the five spacious safari-like yurts with en-suite baths. Even with the northern lights overhead, it’s the bison, prairie dogs, and pronghorn that are the true stars of the show. The American Prairie Reserve assembles Kestrel every summer to finance efforts to preserve the critically affected flora and fauna. 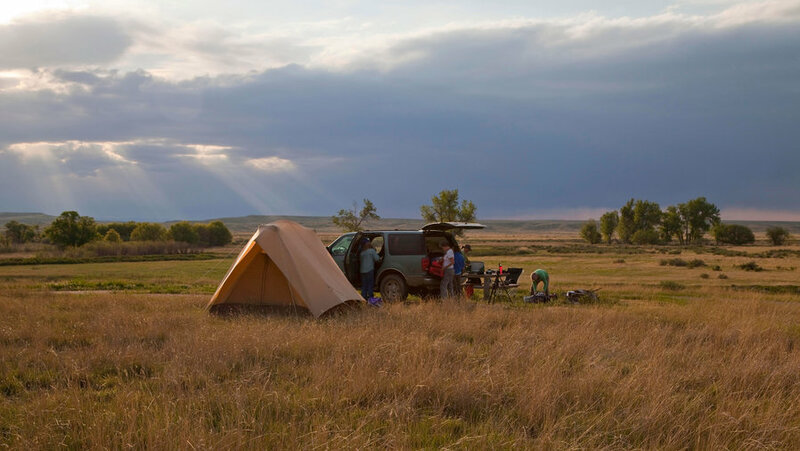 APR also runs the primitive tent sites of Buffalo Camp (pictured) for those looking to experience the prairie for $10; Kestrel, on the other end of the spectrum, is $1,200 per person per night. Both are an hour’s drive from the town of Malta.